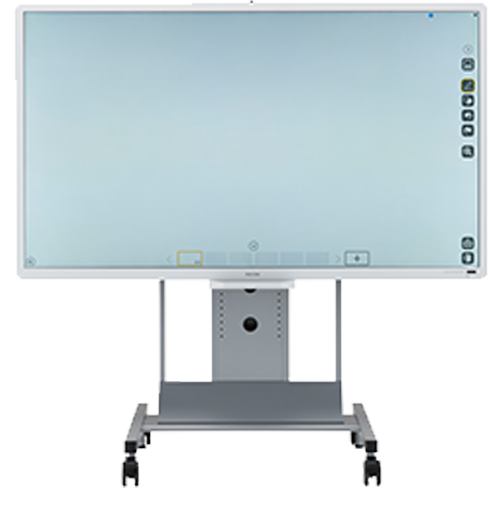 Use the RICOH D8400 Business Edition Interactive Whiteboard to share images, schematics, drawings, videos and more on an oversized 84-inch LCD flat-panel display. With brilliant 4K resolution (3840x2160 dpi), you can get lifelike reproductions in midsize rooms and conference centers. For even larger venues, pair the D8400 digital whiteboard with the RICOH Business Projection System. Enhance your presentation with audience feedback. Use your finger or special felt-tip pen to add text or embedded shapes on the interactive touchscreen. For more detailed visuals, such as schematics and CAD drawings, opt for the optional Pen Sensor Kit to make marks with unmatched precision. Great information can come from anywhere — even those outside the room. Use the D8400 interactive whiteboard for business with up to 20 of our interactive whiteboards or interactive business projection systems in remote network locations. Another 20 participants can log in to each of those devices via a PC, smartphone, tablet or other device to expand your audience even more. Let your audience give you a hand. Up to four participants can make edits directly to the interactive whiteboard screen simultaneously. With Near Field Communications (NFC) technology, participants can download and add images and files directly from an Android® or Windows® device. Remote users can also make edits, add drawings and highlight information on a virtual whiteboard when they download the Ricoh app for iPad®. Work on enhancing your message even after the presentation is over. Email it to recipients in your LDAP directory and have them add notes, annotations and other markings. They can save it as a password-protected, searchable PDF, so you can easily track each revision using keywords. Who sees your presentation is as important as what's in it. Use PIN code authorization so only invited participants can join. When the presentation is over, save it on a USB drive or shared network directory. If you need temporary storage, save it to the board's solid-state drive. Or, you can choose to remove all data automatically as soon as the electronic whiteboard is shut off. Collaboration has never been easier on wireless or LAN networks. Use multiple HDMI ports to connect your choice of audio/visual devices without recalibrations, additional software or IT support. Use the same scrolling and flicking movements you use on your smartphone to zoom around the interactive whiteboard. It's even easy on the eyes, thanks to a special blue light mode that reduces eyestrain.